I found this page and want to share it with all of you, basically the first one on the list and one of the best is ImDisk & ImDisk Tool kit, congratulations to Olof Lagerkvist and v77, two of the valuable members of this forum. As we mentioned earlier, the results can be split into two distinct categories, 4K scores and Sequential (Seq) scores. 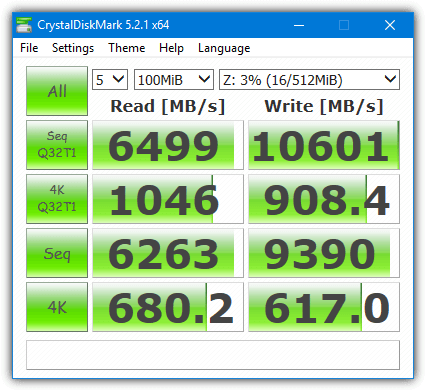 The Q32T1 scores for both sequential and 4K are how well the RAM disk handles multiple file transfer requests at once, so they represent a heavier workload. Bond Disc was the fastest for both sets of 4K scores. The problem is it’s an old and not very user friendly tool focusing more on encryption. The 640MB size limit could also present a problem. More user-friendly and less restrictive tools that did well with 4K were IMDisk, ROG RAMDisk, Ultra RAMDisk Lite, SoftPerfect RAM Disk, OSFMount and Gizmo Drive. It might come as no surprise the software that did well in the 4K scores also mostly did well in the sequential read and write scores. Ultra RAM Disk Lite and SoftPerfect RAM Disk got the highest sequential scores while Gizmo Drive, IMDisk, and Asus ROG RAMDisk were better when the number of simultaneous file requests was increased with the Q32T1 score. For generally faster across the board performance, IMDisk, Asus ROG RAMDisk, Ultra RAMDisk Lite, OSFMount, Gizmo Drive, and SoftPerfect RAMDisk are all good choices. Bond Disc is very fast but may be incompatible or too restrictive for your requirements. What RAM disk you prefer may be down to what other features each software offers that helps you decide which is best for you. Although you can use the original ImDisk driver and Control Panel applet , the ImDisk Toolkit is easier to use. It also includes options to mount floppy, CD-ROM and hard disk image files (ISO, BIN, VFD and etc) as virtual drives. RAM disk size is not limited and there are options to load content from an image file or folder, synchronize at shutdown, enable compression, auto add temporary folders, and allocate memory for the RAM disk dynamically.